Here’s how to subscribe, modify your subscription preferences, or unsubscribe from our electronic mail list. Use this link to reach the form (shown above) used to subscribe to, unsubscribe from, or update your subscription information for the Comunidad Newsletter Distribution list. If you’re already subscribed to our eNewsletter and wish to update your subscription information or unsubscribe from the list, enter the e-mail address which is receiving Comunidad messages plus your first and last name on the form, then click the “Subscribe to list” button that you’ll find at the bottom. The system will then detect that you’re already subscribed to the list and you’ll be offered an opportunity to update your profile information via the “Click here to update your profile” link, which will appear underneath the E-mail address field. Clicking on that link causes a confirmation message to be sent to your e-mail account. 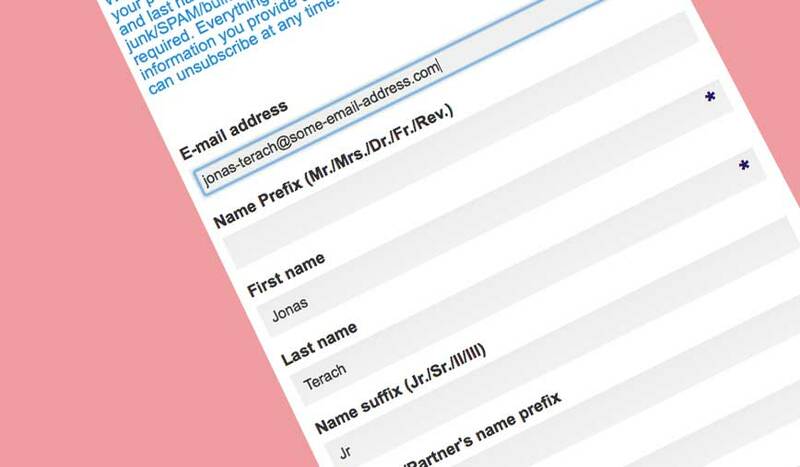 This ensures that only you can update your subscription information or unsubscribe from the list. To continue with the modification or unsubscribe process, respond to the confirmation e-mail message. Doing so brings you to an editable version of your subscription record. If instead of modifying your subscription information, you wish to unsubscribe from the list, you can use the “Unsubscribe” link, which you’ll find at the bottom of the editable version of the profile. If you’re newly subscribing to the list, simply fill out the the form and click on the “Subscribe to list” button that you’ll find at the bottom, which will cause a confirmation message to be sent to the e-mail address you specified. To complete the sign-up process, you must respond to the confirmation e-mail message. We send about 12 to 15 e-mail messages (and, if you’ve provided your postal address, 1 postal mailing) each year. We require your first and last name in order to prevent messages from being sent to your junk/SPAM/bulk folder. And, of course, your e-mail address is required. Everything else asked for on the form is voluntary. The information you provide us is kept confidential; it is never shared. You can unsubscribe at any time. Questions regarding our monthly newsletter should be e-mailed to our newsletter coordinator. Since 1986 St. Matthew’s Parish has been blessed with a vibrant and welcoming outreach to lesbian and gay Catholics, which we call Comunidad. Our all-volunteer steering committee, whose members serve a one-year term, plans, with help from our general membership, interesting topical meetings and coordinates Comunidad’s other activities, which include food and monetary donations to those in need at Christmastime, support of the Long Beach AIDS walk, representaion at the Long Beach Pride festival, and an annual spiritual retreat that takes place in the fall. We also maintain regular contact and coordinate activities with similar ministries at other Catholic parishes in the Archdiocese, with other nearby churches of other faiths, and with regional and national coordinating organizations such as CMLGP (Catholic Ministry with Gay and Lesbian Persons, formerly known as Ministry with Lesbian and Gay Catholics, MLGC) and CALGM, Catholic Association for Lesbian and Gay Ministry.